Dumpster Rental in Fairhope, AL - Easy Haul, Inc.
Dumpster rental and Portable Toilets in Fairhope, Alabama is simple, reliable, and affordable with Easy-Haul Inc. For Fairhope dumpster rental, we provide dumpsters in Prichard, Theodore, Saraland, Grand Bay, Foley, Daphne, Mobile, Tillmans Corner, Citronelle, Gulf Shores, Dauphin Island, Orange Beach, Summerdale, Loxley, Bay Minette and other surrounding communities in the Mobile, Alabama area. We also offer service in the Baldwin, Mobile, Monroe and Escambia county as well. So, whether you need dumpster rental in Fairhope, AL for a roof tear off or in Daphne, AL for a garage cleanout, Easy-Haul can help. We are committed to providing reliable dumpster rental service at the best possible dumpster prices. Don’t settle for the red tape, frustrating service delays, and high prices of a national dumpster rental service. Easy-Haul Containers is locally owned and operated. We will answer your call and get your dumpster delivered right away at the best price in town. That means less time and less money for the homeowners and contractors that need roll off dumpsters in Fairhope. We also offer portable restrooms for your special event or construction project. Easy-Haul Offers Large and Small Dumpsters and Portable Restrooms in Fairhope. 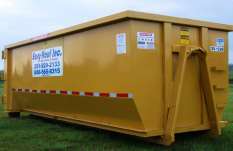 Call Easy-Haul for fast Dumpster Rental in Fairhope and Surrounding Areas – (251) 929-2133. We disclose our pricing right up front with no hidden or add-on charges. Why fight your way through the voice mail system of other companies when you will get the best price and best possible service from Easy-Haul. We have repeat customers who call us everyday because of our great service and price. Call us today for your waste dumpster and discover how we make it easy. We service Mobile County & Baldwin County, Alabama. We provide Same Day service. Every load we haul is protected by a state of the art tarping system. We only haul to licensed landfills specific to the type of waste being dumped. We charge a low flat rate per dump, no delivery fee or add-on fees of any kind. Pricing Chart. © 2004 - 2016 Easy-Haul Inc.